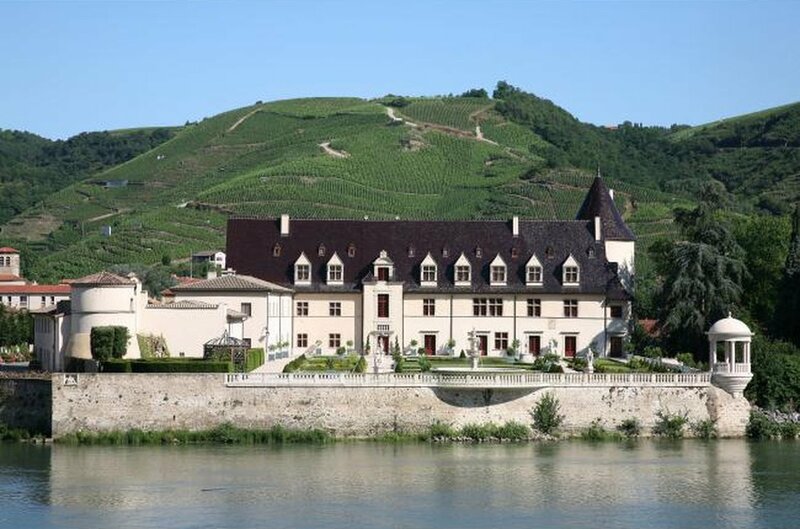 The house of E. Guigal was founded in 1946 by Etienne Guigal at Ampuis, just to the south and across the Rhône from the famous Roman city of Vienne. Ampuis is at the centre of the appellation of Côte-Rôtie , which translates as 'roasted slope' and gives some idea of the vineyards' exposure to the sun. This is a prized site for Syrah. The steep hillside of Ampuis has been producing wine from its terraces for at least 2400 years, a fact that the coins found in the vines prove. Etienne Guigal came as a cellarman and vigneron to the house of Vidal-Fleury, the oldest in the Rhône (founded in 1781) at the age of 14 in 1923. 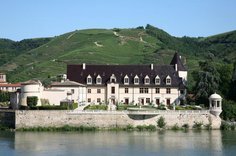 He was involved in 67 vintages of Côte-Rôtie between Vidal-Fleury and Guigal, and his crowning achievement was to buy the house of Vidal-Fleury in 1984. Vidal-Fleury still operates independently of the house of Guigal. Marcel Guigal joined his father in the vineyards in 1961; together they worked to make E. Guigal the fine house that it is today. Philippe, the son of Marcel and Bernadette, is following in the family tradition. He studied initially at the Oenological University in Dijon and subsequently graduated from the International Organisation of the Wine in Paris as a Master of Science in Wine Management. Produced from vines averaging 25 years of age, from the sand and granite terraced slopes of Condrieu. The yield is approximately 37 Hl/ha. Alcoholic fermentation occurs at low temperature, split one-third in new barrels and two-thirds in stainless steel tanks, all of which are Malolactic fermented. The Guigal domain was founded in 1946 by Etienne Guigal in the ancient village of Ampuis, home of the wines of the Côte-Rôtie. In these vineyards of over 2400 years old you can still see the small terraced walls characteristic of the Roman period. Etienne Guigal arrived in this region in 1923 at the age of 14. He made wine over 67 vintages and, at the beginning of his career, participated in the development of the Vidal-Fleury establishment. The Guigal family owns vineyards in Condrieu and in the Côte-Rôtie with illustrious plots producing wines such as ‘La Doriane’ in Condrieu, the famous growths of the Côte-Rôtie ‘La Mouline’, ‘La Turque’ and ‘La Landonne’, Côte Rôtie Château d’Ampuis, Hermitage ‘Ex-Voto’, produced only in the great vintages and Saint-Joseph ‘Lieu-Dit Saint-Joseph’ in red and white, as well as the famous Saint-Joseph red « Vignes de l’Hospice ». These wines have each become flagships of their appellations. From plots on steep slopes, this wine combines vines from Côte Blonde (Silicone limestone soil) and Côte Brune (soil rich in iron oxide). Across both plots the average age of vines is 35 years yielding 37 Hl/hectare. Fermentation in closed stainless steel tanks. Automatic punching down and temperature controlled during 3-week fermentation. Ageing is for 36 months in oak barrels of which half will be new oak. 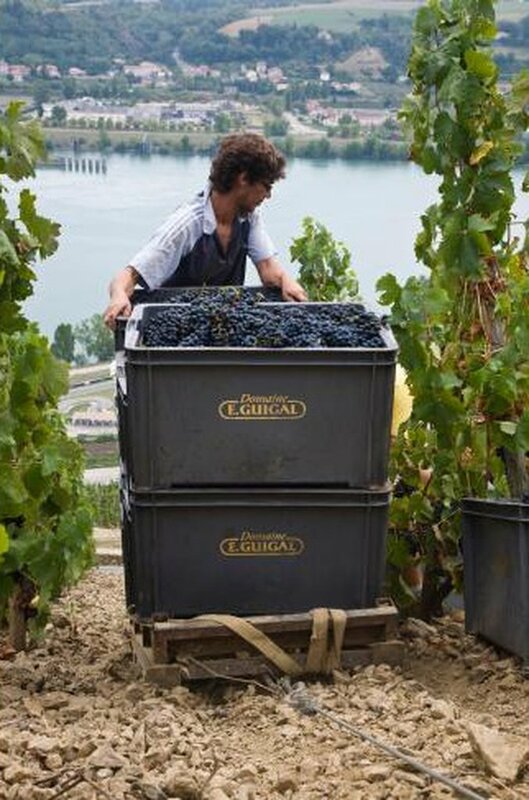 From varied soils accross the Rhône: sediment, limestone, granite, Pebbles and Alluvia. Average age of vine is 35 years producing a yield of 41 HI/ha. Traditional winemaking methods, temperature controlled fermentation, long soaking on the skins. Maturation is 1½ years in oak foudres. The vineyard comprises of various soils made up of limestone and granite. The vines are approximately 50 years old. The grapes are harvested and pressed. Temperature controlled alcoholic fermentation in stainless steel tanks. Aged for 38 months in new oak barrels.